Fall is here! 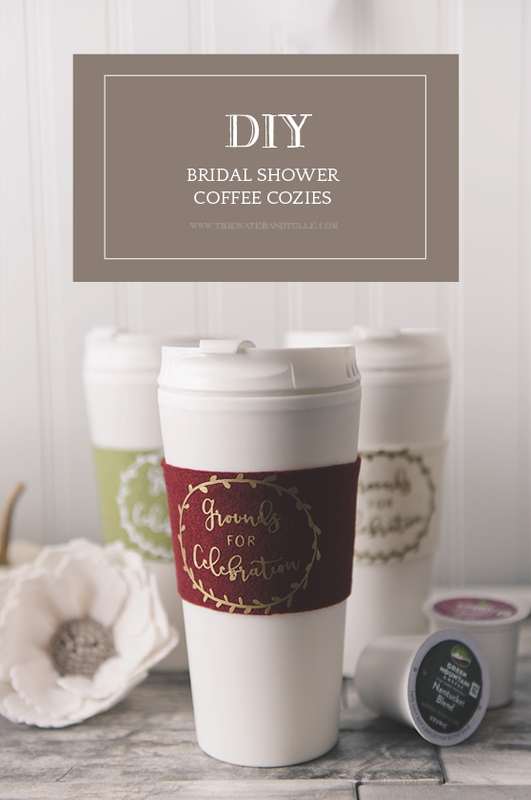 While we're all basking in the gloriousness that is red, orange, and yellow-dappled trees as we don our favorite boots and scarves, it's time to also think about the couples getting married in the most colorful and cozy season ever... and those bridal showers that accompany wedding planning! 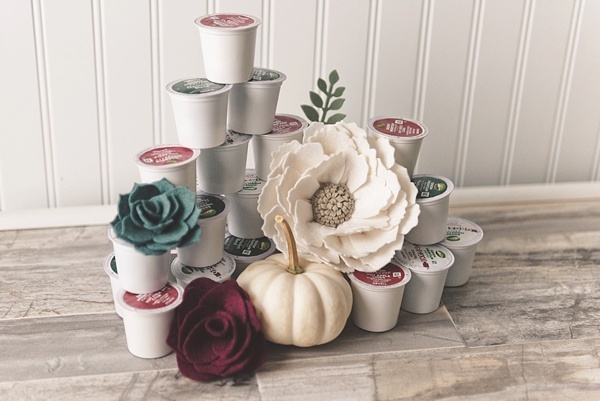 In partnership with our friends at Keurig Green Mountain®, we’re sharing our latest DIY tutorial for the cutest and easiest bridal shower favors you'll ever make: no-sew felt coffee cozies! 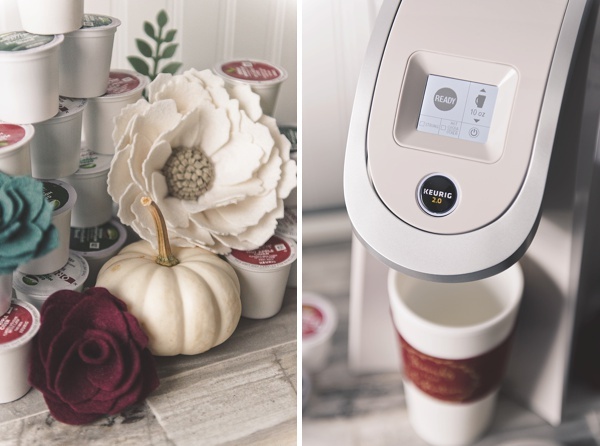 With dozens of K-Cup® pod flavors, you can set up a hot beverage station at your BFF's bridal shower with hot apple cider, rich coffee, and sweet hot cocoa, so no matter what the guests' preference is, they can brew a mug and slide on an adorable "Grounds for Celebration" cozy to save their hands as they toast the upcoming wedding day! 1. Lay out all of your materials. We'll first start with the felt. 2. 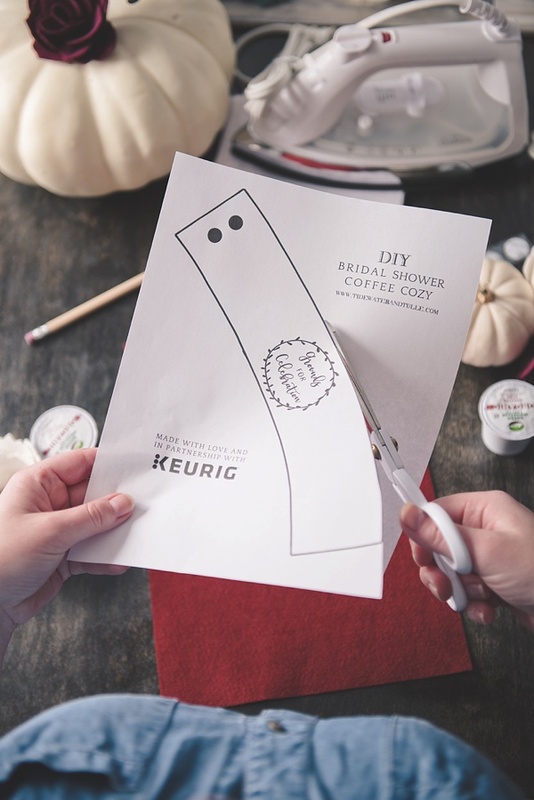 Download and print our FELT COFFEE COZY template to help you trace and cut onto your felt. Be sure not to adjust the print settings to enlarge or shrink the template. Print to "fill the entire page" or your print settings' equivalent. 4. 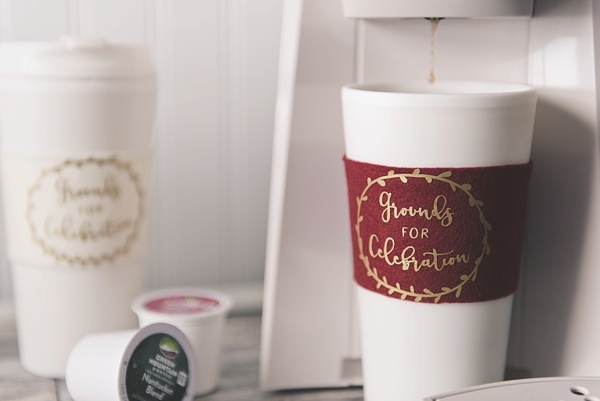 Download our GROUNDS FOR CELEBRATION graphic and upload into your personal electronic cutting machine software (I used my favorite and preferred Cricut Design Space for my iron-on decals!) and set up your iron-on material on the adhesive grip mat. Be sure to size graphic no larger than 2 ½" wide – if it is any bigger, it may not fit on your cozy! Important Note: For iron-ons, you must make sure it is a mirror image before you cut, or it will iron-on backwards on your cozy! Your software should have the option clearly marked before cutting. 5. 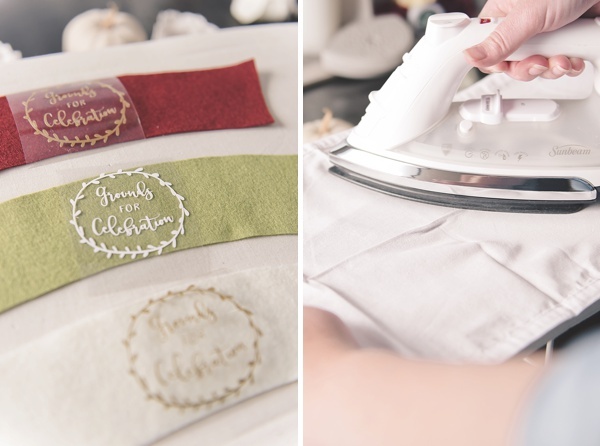 After you weed out the negative space on your freshly cut graphic, leaving only the words and wreath, preheat your iron to the highest setting (such as Cotton) and set up your ironing board. 6. 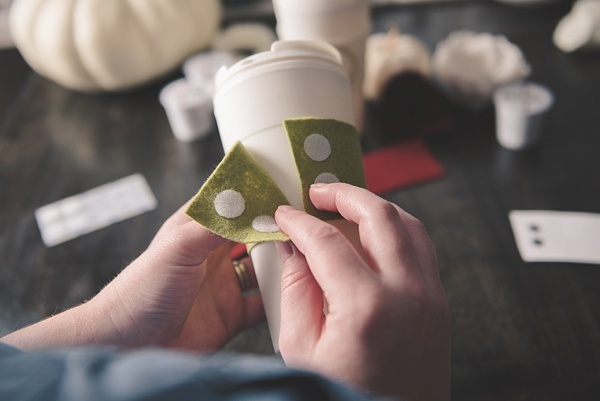 Place your cut graphic (shiny liner side-up) in the center of your coffee cozy and a press cloth on top of that. Using the iron, press down over the cloth applying equal amount of heat with about eight (8) left-to-right swipes. Carefully lift the shiny liner to see if the iron-on material has transferred onto the felt. If it has not, cover with the press cloth again and continue to apply heat to that area until the iron-on material removes itself cleanly and completely from the liner. 8. Allow your cozy to set for a minute and then grab your coffee tumbler to accessorize it with your new cozy! 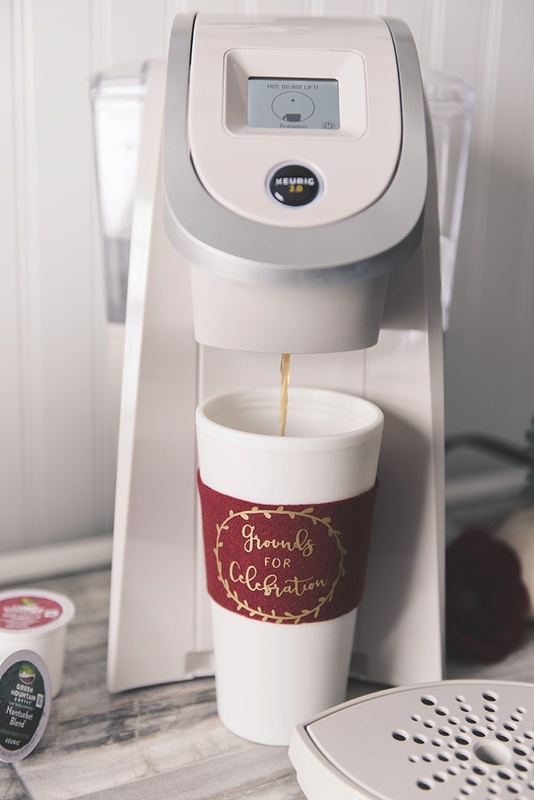 For any kind of station at a bridal shower, I'm a huge fan of making sure it's very user-friendly and simple... that's why having a Keurig® brewing system on the station is perfect because you literally get your beverage your way at the touch of a button in less than one minute! Let your guests pick, choose, and brew. 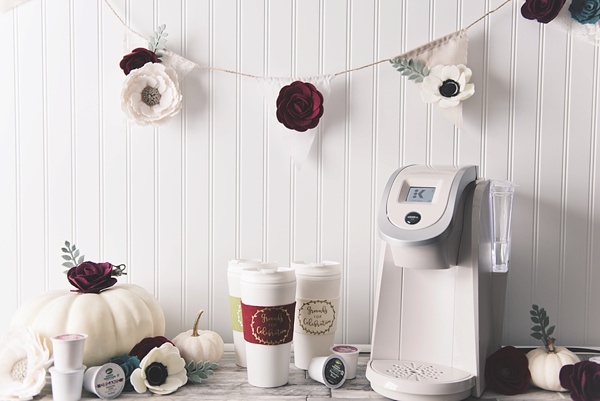 With a range of Keurig® brewer colors available, you're bound to find one that fits the party theme. The Sandy Pearl brewer I chose for this tutorial is perfectly suited all things wedding and is a nice neutral to go with the rest of your color palette... and double bonus, it makes a perfect gift to the bride after the event! For the rest of the station, enhance the hot beverages with caramel candies for hot apple cider, fall-inspired flavored creamers for coffee, mini marshmallows for hot cocoa, and even custom-shaped sugar cubes for tea. 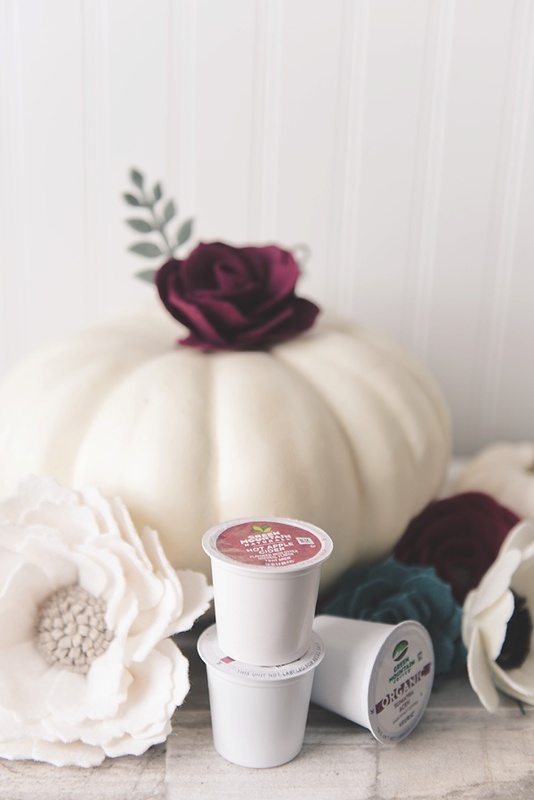 Surround your Keurig® brewer with trays of color-coordinating K-Cup® pods, add some festive décor like pumpkins and felt flowers, include a "Fall in Love" or "Love is Brewing" sign, and there you go – a yummy autumnal scene that any coffee-loving guest will swoon for! 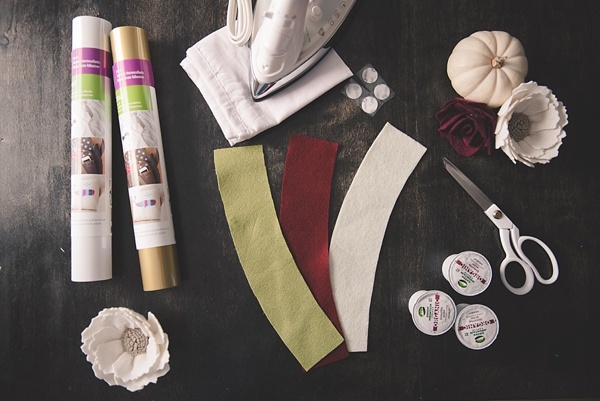 Many thanks to Keurig® for partnering with Tidewater and Tulle for this cozy DIY tutorial! And while the disclaimer is that I was sponsored through compensation to design this, the words and my loyal love for the brand are all my own. Some of the above product links are affiliate-linked and purchasing through these links helps support our wonderful sponsors and Tidewater and Tulle! You can find our full affiliate disclosure policy here.